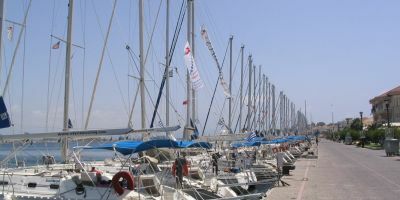 Looking to sail from Preveza? Search to find and book your ideal boat, or read everything you need to know: prevailing winds, where to sail, how to get there and more! Preveza marina is minutes from the airport and a brilliant base for exploring the North or South Ionian islands - in fact, the most difficult decision is whether to head North to Corfu, Parga and the stunning Paxi islands or South via Lefkas and classy Meganissi to Kefalonia, which some say is the most beautiful island in the Mediterranean. The Ionian has been a sailors paradise for thousands of years and even features in Greek Mythology. Thankfully, there's no sirens to tempt you into the rocks any more, but you will find delightful sunshine, reliable winds, plenty of anchorages and marinas, friendly locals, and incredible scenery. It's impossible to sail here and not come back loving it - give it a go and you won't be disappointed! From Preveza, you can head south to visit the old town of Lefkas, and then onwards to beautiful Sivota, Ithaki and the island of Kefalonia. Alternatively, head north to visit historic Corfu and the natural beauties of Paxos and Antipaxos. In any direction, you’ll find fine beaches, sunshine, and exhilarating cruising – it’s easy to see why the Ionian is one of the world’s most popular sail cruising destinations. This stunningly beautiful Greek island village boasts white cliffs, sandy beaches, turquoise seas, pine forests, and white-washed houses. It’s an incredible place to visit or spend the night. Ithaki is the home of the legendary Odysseus, no less, and the arrival into Vathi marina is spectacular: the village is built up on the hillside around the marina, so that it feels as if you’re entering a giant amphitheatre! Many people list Kefalonia as the most beautiful island they’ve ever seen, and it was the inspiration for the romantic Captain Corelli’s Mandolin. It’s a real gem, and well worth a visit! 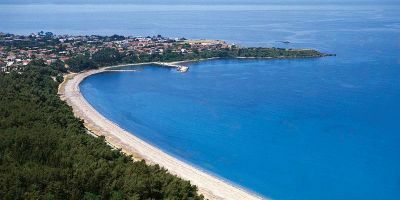 Preveza is based in the middle of the Ionian islands, which means that there are two options when you’re sailing out of it: you can either head North to Corfu, Paxos and Antipaxos, or head South past Lefkas to visit Kefalonia and Meganissi. For this itinerary, we’re heading South, principally because Kefalonia is the most beautiful island in Greece, so if you have the chance, you should go and see it for yourself! 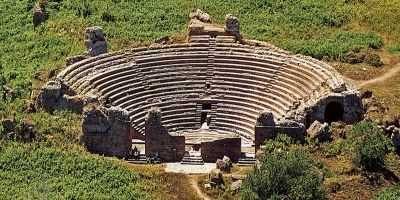 (But if you want to read about the places in the North Ionian area, check out the itinerary on our Corfu destination page). This itinerary is 122 nM, which should mean you’ll be sailing for around 4-5 hours a day (at an average speed of 5-6 knots), leaving plenty of time to explore the start or end points, or even just dropping the anchor in any old bay you’re heading past. It’s the start of another fine week. The weather is looking good and sunny, and the prevailing wind is a reasonably strong Northerly wind, which will speed us on our way down to Kefalonia. After briefing the crew, you can release the lines and we’ll be ready to gently ease of the marina, past Preveza old town, and down to the Lefkas canal, which links the North and South Ionian islands. You’ll most likely be part of a stream of charter boats as you follow the channel south, passing the busy tourist resorts for land-folk of Nikiana and Nydri before we get to break slightly away from the beaten track by bearing South-East above and round Meganissi island to head to Kalamos town on the south side of the island of Kalamos. It’s only a small town, with a population of about 500 people, and they only got running water and electricity as late as 1996, but Kalamos used to house an important Roman fort (for controlling piracy in the Mediterranean) in ancient times, and there was a time when as many as twenty thousand women and children are estimated to have sought refuge here during the Greek revolution in 1821. The island was also once part of the British empire! Not that you can see much of this heritage, beyond a scattering of old ruins. Kalamos is now a quiet village with beautiful beaches and crystal clear waters, and a tranquil and relaxing place to bob about in. From Kalamos, you’ll need to bear South-west past the island of Atokos and onwards to the Vathi on the isle of Ithaki. In the prevailing wind, it’s likely you’ll need a broad reach to run with the wind, but it is pretty much one straight line all the way. If you have the time, there is a quiet bay on the South side of Atokos which is well worth visiting, and would make an excellent place to stop for lunch. Vathi is capital of Ithaki and is very well protected by a natural channel that you have to traverse down to meet the town. Watch out for old cannons from the Venetian empire as you go down it – they are still in situ and threaten all who arrive by boat, but thankfully they’ve been dormant for centuries now. You certainly wouldn’t fancy your chances if they were still active! The sail into the port is the best part of Vathi, because the sheer grandeur and wonder of the town takes you by surprise: there are buildings lining the hillside around the bay, making the marina seem like the centre of a giant amphitheatre. Truly marvellous. Ithaki (or, in English, Ithaca) is probably somewhere you have heard of. It featured in Homers classic poem the Odyssey, large parts of which - the Cyclops, sirens, the battle of Troy, Achilles heel, for instance – have made it into popular culture and they even hit the cinemas every few years. Well, this is where the hero, Odysseus, lived and reigned as King. The local tourist board even claimed to have located a grand palace from 800 BC on the island, so there’s now some thought that Odysseus was actually a real person, and not just a fictional character. Vathi is another cute little town which has a great range of seafront bars and tavernas, and the people here are very welcoming as the night draws in. From an island made famous by literature from 800 BC, to an island made famous by something a lot more recent. Our next port of call is Sami, a town on the island of Kefalonia (or Cephalonia in English), which was the setting for the classic novel Captain Corelli’s Mandolin – a romantic tale by Louis de Berniere which saw a world war two soldier based on Kefalonia falling in love with a local girl (and the island, and Greek way of life). Looking at the scenery, it’s easy to see why some people say this is the most beautiful island in Greece. Indeed, the scenery is so remarkable that after visiting the island for a field trip, the Director of the film version of Captain Corelli’s Mandolin insisted that they had to film it here, because it would be impossible to replicate, even with CGI. If you watch the film, which stars Nick Cage, then you’ll almost certainly spot parts of the town of Sami and the nearby beaches, because this is where they did the bulk of the filming. In terms of the sailing, after the single tack straight line of yesterday, today you’ll travel in every single direction possible, so you’ll need to keep on your toes. It’s quite simple to navigate though – just keep the coast of Ithaki on your starboard side after leaving Vathi, and then hop over to the next island when you see it. There’s a decent beach in the bay immediately before you arrive at Sami (Antisamos beach) which is worth nosing in to if you have the time to spare – it’s supposed to be one of the top ten beaches in the whole of Greece. Sami is a small market town by day, but has a holiday buzz and an almost lively atmosphere after night falls. There’s a small number of shops and tavernas, but plenty of character. Sami is the furthest we travel on this itinerary, and now we’ll turning back towards Lefkas and sailing North. You’ll be beating up the prevailing wind as you move up the channel between Ithaki an Kefalonia, passing Fiskardo at the top of Kefalonia. Fiskardo, whilst still being a fishing village, has more shops than both our start-point Sami, and the end-point of Sivota, so if you have the time, it could be worth getting some provisions in here. Either way, it’s worth nosing into the bay here to see what Fiskardo is all about, as it’s (another) very pretty little village. From Fiskardo, you bear slightly North-Easterly, ideally close-hauled so that you can make good speed across to the island of Lefkas. Sivota is at the end of one of the bays on your port side, and is very well sheltered from the prevailing winds of the season. Sivota is an exclusive tourist resort, with a number of all-inclusive hotel resorts nearby. The town is quiet during the day (whilst the sailors are out at sea, and the landlubbers are sat by their pools), but the bars and tavernas liven up at night time. You’ll see for yourself what a beautiful place Sivota is, and it’s hard to put into words, or to pick out this particular part of the Ionian when the whole area is delightful, but Sivota has sandy beaches, white limestone cliffs, clear turquoise seas, green pine forests and a scattering of white buildings, and it certainly deserves its place on all the postcards. It’s a blissful place to spend the night. There’s not many nautical miles between Sivota and Meganissi, but there’s plenty of options for whiling away the hours in luxury, and it’s quality sailing. Once you’re bored of Sivota (if that’s possible), you can visit the cave of Papanikolis, then sail around the south side of Meganissi where you’ll find lots of beautiful and secluded beaches. You can even set people on land and they will probably be able to walk to Vathy town quicker over land than you’ll be able to sail around the rest of the island. Papanikolis cave is notable because it’s absolutely massive. At 120m in length, it’s the second longest in Europe, and is even long enough to feature a turn in it, offering even more chance of concealing yourself. Back in the day, boats used to hide in the cave to escape from pirates (that was before charts, let alone the internet, so they’d be unlikely to know about the cave! ), and, most recently, it was used as a hiding place for the Greek Papanikolis submarine in world war two. Following the coast-line round, you’ll arrive at the pretty little fishing village of Vathy, which is fast becoming a popular tourist resort for its serene and beautiful beaches. There’s a few tavernas splayed alongside the waterfront here, which are perfect to relax in and watch the water, or, if you want more choice, the next nearest town is only a kilometre or so away by foot. From Meganissi, Preveza is pretty much due North, into the wind, up the Lefkas channel and through the Lefkas canal. It’s only 18 nM, so it might only take you a few hours of sailing – which means you might have time to explore Meganissi on foot (there’s a few beaches within a short walking distance), or to stop off somewhere on the way – both Nikiana and Nydri are popular with tourists and will appear on your port side as you make your way North. You could also stop at Lefkas and visit the old town there, but there might be a lot of charter traffic there. After arriving in Preveza, you should return the boat to the area of the marina where you found it and follow instruction about refuelling – usually there is a mini-tanker which comes around which will refill your tank, but check with our charter partner as to how it works for them. Once you’re moored up then you’ve completed the sailing for the week, and hopefully you’ve gotten the boat and your crew around safely. Someone will likely come and inspect the boat, but you’re staying on the boat for one more night. If you haven’t yet seen Preveza old town, then now is a good time to check it out. There’s narrow streets and seafront bars, but the view is never quite as good from the land as it is from the water. Hopefully you will’ve enjoyed your time sailing, and right now you’ll have a big smile on your face, a bit of a tan, stronger friendships with all your crewmates, and a whole headful of memories of an epic voyage. And then we’re done. Have a safe flight home, and come and visit us at PlainSailing.com to start planning your next great adventure! 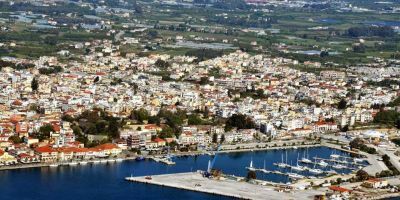 Preveza, like the whole of the Ionian, has such beautiful weather that tourists flock to the area, regardless of what else there is to see or do there. Thankfully there’s beaches, seas, ruins, old towns and festivals, but you get a sense that people would still come for the weather, even if they had to sunbathe on a concrete wasteland. The best time to go is between May and October, when temperatures are almost always over twenty degrees Celsius, and you can relax in the warmth of the sun. The one caveat to that being that sometimes in mid-July to mid-August, temperatures can go a bit too high – often reaching the high thirties or even forty degrees for a couple of days at a time. Forty degrees is so sweltering that you won’t be able to do much without breaking a sweat, and it certainly makes the sea and ice cream very inviting. Getting out on the sea in the wind is a good way to cool down. In winter, the temperatures remain mild, but there is an increased chance of rain – generally it only ever rains in the winter – though you will also likely still find constant sunshine too. You can swim in the Ionian all year round, and the sea is never colder than 15 degrees – which will feel fresh, but not freezing. For the sailing season, early on the sea hits about 20 degrees - which is a refreshing temperature for diving into the sea to escape the hot sunshine – and the sea temperature gets as warm as 25 degrees (which will feel like a swimming pool) by the later part of the season. As well as sunshine in abundance, the wind is perfect for sailors in the Ionian. It generally ranges from Force 3 to Force 6, which should mean that you are sailing happily, and making good speed around the islands. The average you can expect from a yacht or cat is about 6 knots in this area. The winds are reliable, tending to be strongest during the mid-morning and late afternoon, before petering out to a light breeze when dusk falls. The prevailing wind during the summer months is a Northerly wind, which zips down the mainland coastline from further up the Adriatic. That means you should be able to move quickly up and down the coastline, which is useful, as there isn’t much traversing to be done in this cruising ground anyway. In winter, there is no such thing as a prevailing wind, and the winds come from the mountains in the North or the tropical South. The winds can also vary in strength from non-existent to challenging, and there are even times when the local fisherman don’t even go out in them – but most weather systems pass after a couple of days, so you should still have a fun voyage even outside of the main sailing season. What is the Current Weather in Preveza? Located close to Lefkas (and now easily linked by Greece’s first underwater tunnel), Preveza is fast becoming a tourist destination in its own right – particularly with travellers who arrive via low-cost airlines at the nearby airport. The town and beaches are a little more relaxed than its nearby sister, and the less raucous atmosphere (and proximity to ancient sites) make it ideal for people who enjoy a little culture with their sunshine. Preveza offers an interesting and unusual mix of architecture, and it is optimally located for exploring the Roman ruins of Nicopolis (Once the Capital of Roman Greece) and Greek Kassope (which is a magnificent Greek hilltop village which pre-dates 400 BC) which are only a handful of kilometres away. 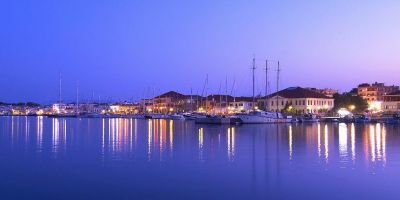 Preveza obviously also has a bustling Marina, which is shared with local fishermen – which means it also offers exquisite and fresh sea-food. And there’s a number of beautiful beaches – not least Monolithi beach, which is 5km down the coast and widely regarded as offering the best place to watch the sun set in the whole of Greece. Near to the marina is a Luna park amusement area, and it’s only a short stroll into the old town, which is a great place to admire architecture and to people watch. Preveza has a few interesting events taking place, which are worth a look if you are in the area, but potentially not worth planning your trip around. In the last Thursday of lent, there is a women’s only carnival, where over 200 floats and 1,000 women march though the town. Throughout the summer, there’s a festival of culture designed to keep locals busy, and tourists entertained. The Preveza festival or Nikopolia runs from June to early September, and showcases theatre, music, dance and art – usually always in both Greek and English. In July, there’s also the international choral festival, when choirs from around the world battle it out in venues and on the streets of Preveza, and later in the month there’s a local folk dancing weekend across the region, with events culminating with a glorious night of dance in Preveza town. Finally, in August, there is a Sardine festival for the foodies, where they do everything you can think possible with this locally caught fish – including grilling 2 tons of it and handing it out for free in the main square! To Rempetiko Steki – just a stone's throw from the marina (if you have a good arm) this place does the best seafood in town. The grilled squid is amazing, but it’s worth sharing a selection to really get a taste for the place. Very reasonable prices. (Andrianoupoleos 5, Preveza). Amvrosios Fish Taverna – A classic Greek taverna which will serve you anything you want, as long as it’s fish. They get their share of the freshest local fish and turn them into sumptuous and filling dishes. If you like fish, you’ll love this place, but you might need to get here early or be prepared to queue. Our favourite dish is the Sardines: unbelievable. (9 Grigoriou Pemptos, Preveza). To Tempelzaneio – Another great fish restaurant, though this one is notable for its sea bass with pasta. It’s situated in the heart of the old town and is a cosy place to sit and eat. Recommended. (Adrianoupoleos & Niklampa, Preveza). Preveza is a small tourist town on mainland Greece. The late night revellers head further north to Parga or Corfu, so you there isn’t much of a club scene, but it has sunshine, beaches, tavernas and bars, and, with tourists jostling about the place, it is a pleasant place to sit and relax at any time of day or night. Bar Tserki – a street café which serves coffee all day, and beer, cocktails and Ouzo at night. It’s nicely decorated, has a good vibe, and its house wine is very drinkable (1 Dardanellion, Preveza). Café Barrio – a very stylish bar in the old town, which sometimes has live music on, of all types and sounds. There’s a reasonably lively atmosphere, particularly at the weekends (83 Eth. Antistasis, Preveza). Diem espresso – the place to go for cocktails – including the ‘Jack Sparrow’ which is served in a pirate mug, which sounds like a nice gift for your skipper, no? (Eleftheriou Venizelou, Preveza). Zikas Hotel *** – c. £35 for a double room – the nearest hotel to the marina, as well as being one of the best value hotels in the area (on account of its slightly out of town location). All rooms have a balcony, with some having brilliant views out over the sea and the marina. Dioni Boutique Hotel **** - c. £100 for a double room – located in the heart of the old town, and just 500m from a beach, this is an elegant hotel, and the staff go out of their way to give you exceptional service. Breakfast is included. 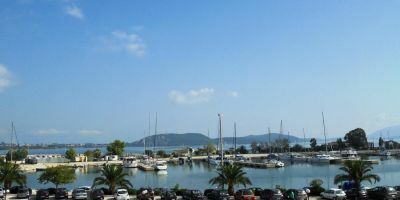 Preveza City Hotel *** - c. £60 for a double room - this is a comfortable hotel, with a brilliant room-rate given its location in the old town, and without being more than 600m to the marina. The hotel serves a decent breakfast and can even lend you free hire bikes to go exploring whilst you wait for your boat to be ready. 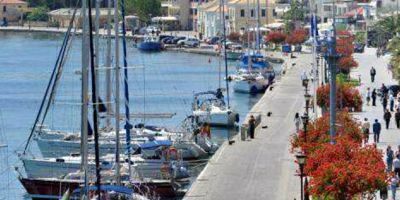 The main marina in Preveza is pretty much in the heart of this cosmopolitan town, which means that everything you need is close to hand. It offers space for over 300 yachts, as well as all the usual mod-cons like wifi, a restaurant or bar and a mini-market, a laundry station, a play area for the kids, and car rental for if you’d like to explore a little further afield on land. A brand-new toilet and shower block was built in 2016, so the facilities are clean, and modern. 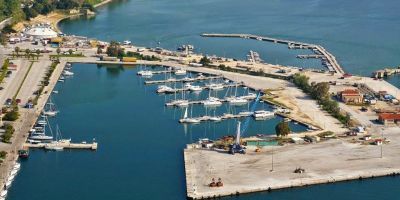 Preveza Marina is easily accessible by air – with operators flying direct to Preveza airport from Manchester, Birmingham, London and Edinburgh, as well as from across Europe. Once at the airport, either hop onto a local public bus to Preveza centre (and the marina is a five to ten minute walk away) or grab a taxi for the 10 minute ride – we can help you arrange an airport transfer – just ask when booking.